On Monday June 26, at approximately 10:59 am, Deputy Jeff Lee made a traffic stop in the 1100 block of Central Frwy. The 32-year-old male was issued a citation for Speeding and Possession of Drug Paraphernalia. On Tuesday June 27, at approximately 12:42 am, Deputy Matthew Schenck made a traffic stop in the 1000 block of Scott. The 22-year-old female driver was placed under arrest. She was transported to the Wichita County Detention Center and was charged with Driving While Intoxicated and Unlawful Carrying of Weapon. On Friday June 23, at approximately 8:08 am, Deputy J.T. Mitchell and Deputy Hunter Deason responded to the 6000 block of Clyde Morgan Road in reference to a Burglary of a Habitation. Upon arrival, the Reporting Person reported that an unknown person(s) entered the residence through an unlocked window and stole several hand tools. On Friday June 23, at approximately 4:03 pm, Deputy Brian Koschak made a traffic stop at the intersection of Flood and Park. The 52-year-old male driver was unable to provide a drivers license or financial responsibility and the vehicle was impounded. On Saturday June 24, at approximately 1:16 am, Deputy Matthew Schenck made a traffic stop in the 4200 block of Seabury. The 26-year-old male driver was placed under arrest. He was transported to the Wichita County Detention Center and was charged with four outstanding warrants for two counts of No Drivers License in Possession, Expired Motor Vehicle Registration and Driving While Intoxicated-with open container. On Saturday June 24, at approximately 10:11 pm, Sergeant Ralph Burdick responded to the area of U.S. 287 and Fisher Road in reference to a Check Welfare. Upon arrival, the Reporting Person reported that a juvenile male was observed riding a bicycle in the median of the roadway. The juvenile’s mother was contacted and upon her arrival, he was released to her custody. On Sunday June 25, at approximately 12:24 am, Corporal Cole McGarry, Deputy Carl Magee and Deputy Caleb Myers responded to the 6100 block of Peterson Road North in reference to a Disturbance. On Sunday June 25, at approximately 4:29 am, Sergeant Greg Wilson and Deputy Ivan Galarza made a traffic stop in the 2500 block of Ave. O. The 24-year-old female driver was placed under arrest. She was transported to the Wichita County Detention Center and was charged with Driving While Intoxicated. On Sunday June 25, at approximately 4:42 pm, Lieutenant Will Rutledge made a traffic stop in the 600 block of Sunset. The 25-year-old male driver was placed under arrest. 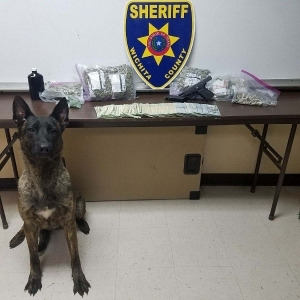 He was transported to the Wichita County Detention Center and was charged with Possession of Marijuana over four ounces under five pounds and Evading Arrest or Detention with a Motor Vehicle. On June 20, 2017, at approximately 3:09 pm, a Wichita County Sheriff’s Office Highway Interdiction Deputy made a traffic stop at the intersection of U.S. 287 and Midway Church Road. The 35-year-old male driver, Robert Christopher Robinson, and a 19-year-old male passenger, Malik Eugen Ruff, were placed under arrest. They were transported to the Wichita County Detention Center and were charged with Possession of Marijuana over four ounces under five pounds, Manufacture/Delivery of a Controlled Substance PG 2 over four grams under 400 grams, Manufacture/Deliver of a Controlled Substance PG 4 over four grams and Possession of a Controlled Substance PG 3 under 28 grams. 2.2 pounds of high grade marijuana, 74.24 grams of ecstasy, 6.55 grams of codeine and 1.38 grams of zanax was seized. On Tuesday June 20, at approximately 3:09 pm, a Wichita County Highway Interdiction Deputy made a traffic stop at the intersection of U.S. 287 and Midway Church Road. The 35-year-old male driver, Robert Christopher Robinson and a 19-year-old male passenger, Malik Eugene Ruff were placed under arrest. They were transported to the Wichita County Detention Center and were charged with Possession of Marijuana over four ounces under five pounds, Manufacture/Delivery of a Controlled Substance PG 2 over four grams under 400 grams, Manufacture/Delivery of a Controlled Substance PG 4 over four grams and Possession of a Controlled Substance PG 3 under 28 grams. 2.2 pounds of high grade marijuana, 74.24 grams of Ecstasy, 6.55 grams of codeine and 1.38 grams of zanax was seized. On Wednesday June 20, at approximately 8:54 pm, Deputy David Stout and Deputy Erick Jerrols responded to the 2000 block of F.M. 171 in reference to a barred person. Upon arrival, a 47-year-old female was placed under arrest. She was transported to the Wichita County Detention Center and was charged with an outstanding warrant for Larceny of an Automobile and was barred from the property. On Tuesday June 20, at approximately 2:20 am, Deputy Amanda Price made a traffic stop at the intersection of Kell and Taft. The 18-year-old male driver was issued a citation for No Driver’s License and Unrestrained child under 15 years of age unsecured. A 19-year-old female passenger was issued a citation for Possession of Drug Paraphernalia. On Tuesday June 20, at approximately 9:16 am, Sergeant Sergio Teruel and Corporal Josh Brown responded to the 8500 block of Seymour Highway in reference to a Burglary in Progress. Upon arrival, the Reporting Person reported that he found a subject sitting in the driver’s side of his vehicle. The 26-year-old male suspect was located in the 8300 block of Seymour Hwy. He was placed under arrest and transported to the Wichita County Detention Center and was charged with Burglary of a Motor Vehicle. On Monday June 19, at approximately 6:05 pm, Lieutenant Will Rutledge and Deputy Brian Koschak responded to the 5600 block of Old Electra Road in reference to a Disturbance. Upon arrival, a 29-year-old male was placed under arrest. He was transported to the Wichita County Detention Center and was charged with two outstanding warrants for speeding in a school zone, and Failure to Maintain Financial Responsibility. The male was also barred from the property. On Monday June 19, at approximately 1:48 pm, Deputy J.T. Mitchell and Deputy Hunter Deason responded to the 2400 block of Wranglers Retreat in reference to a possible Disturbance. Upon arrival, the Reporting Person reported that a subject made a threatening gesture towards her children that were riding in a golf cart in the 2000 block of Sligar. On Thursday June 15, at approximately 3:47 pm, Deputy Jason Vandygriff, Deputy Kristian Valdez and Deputy Joshua Hernandez responded to the 2500 block of F.M. 1206 in reference to a Burglary of a Habitation. Upon arrival, the Reporting Person reported that an unknown person(s) opened the front door of the residence and entered. A trailer house located at the rear of the residence was also entered. On Thursday June 15, at approximately 10:02 am, Deputy J.T. Mitchell and Deputy Hunter Deason responded to the 5700 block of F.M. 1206 in reference to a Theft. Upon arrival, the Reporting Person reported that an unknown person(s) opened the door to an enclosed porch and entered. A snow cone machine valued at $400.00 was stolen. On Thursday June 15, at approximately 2:45 pm, Deputy Jason Vandygriff responded to 900 7th Street in reference to an Identity Theft. Upon arrival, the Reporting Person reported that a subject has been using her deceased husband’s identifying information for several years. On Thursday June 15, at approximately 1:37 pm, Deputy J.T. Mitchell and Deputy Hunter Deason responded to 610 Holliday in reference to a Theft that occurred in the 400 block of Yucca Drive. Upon arrival, the Reporting Person reported that an unknown person(s) stole a package containing a 1000 watt RCA home theatre system that had been delivered to his front porch earlier in the day. On Friday June 16, at approximately 1:38 am, Lieutenant Mark Whipple made a traffic stop at the intersection of 9th Street and Hayes. The 59-year-old male driver was placed under arrest. He was transported to the Wichita County Detention Center and was charged with Driving While Intoxicated and Possession of a Controlled Substance PG 1 less than one gram. On Friday June 16, at approximately 8:30 am, Deputy Sonja Aries and Deputy Kim Ames stopped a 36-year-old female at the Courthouse located at 900 7th Street. She was placed under arrest and was escorted to the Wichita County Detention Center. She was charged with Places Where Prohibited Weapons Prohibited. On Friday June 16, at approximately 8:43 pm, Sergeant Ralph Burdick made a traffic stop at the intersection of 5th and Scott. The 19-year-old male driver was placed under arrest. He was transported to the Wichita County Detention Center and was charged with Possession of Marijuana under two ounces. On Friday June 16, at approximately 9:47 pm, Deputy Jason Vandygriff made a traffic stop in the 1100 block of Sheppard Access. The 24-year-olde male driver was placed under arrest. He was transported to the Wichita County Detention Center and was charged with Driving While Intoxicated with open container. On Friday June 16, at approximately 9:03 pm, Deputy Kristian Valdez and Joshua Hernandez made a traffic stop on Sunset Lane north of Iowa Park Road. The 56-year-old male driver was placed under arrest. He was transported to the Wichita County Detention Center and was charged with Driving While Intoxicated 2nd Offense. On Friday June 16, at approximately 5:03 pm, Deputy Brian Koschak made a traffic stop at the intersection of South Rosewood and Walnut. The 23-year-old male driver was placed under arrest. He was transported to the Wichita County Detention Center and was charged with Possession of Marijuana under two ounces. On Friday June 16, at approximately 8:09 pm, Deputy Brian Koschak made a traffic stop at the intersection of Martin Luther King and Sullivan Street. The 63-year-old male driver was placed under arrest. He was transported to the Wichita County Detention Center and was charged with three outstanding warrants for Capias Pro Fine-Fail to Identify/Fugitive from Justice, No Drivers License in Possession and Open Container Violation. On Saturday June 17, at approximately 8:54 pm, Deputy Jason Vandygriff responded to the 900 block of Bell Road in reference to an Assault. Upon arrival, the Reporting Person reported that he was assaulted by a subject while he was in the 4000 block of Bacon Switch Road. On Saturday June 17, at approximately 4:31 pm, Corporal Josh Brown and Deputy Erick Jerrols made a traffic stop in the 2200 block of Ave H. The 18-year-old male driver was placed under arrest. He was transported to the Wichita County Detention Center and was charged with an outstanding warrant for FTA-Possession of Marijuana. On Saturday June 17, at approximately 9:12 pm, Sergeant Greg Wilson and Deputy Eric Jerrols responded to the 100 block of Southgate Gardens in reference to a Disturbance. Upon arrival, the Reporting Person reported that she had been assaulted by a subject. On Sunday June 18, at approximately 1:44 am, Sergeant Greg Wilson made a traffic stop in the 1000 block of Indiana. The 39-year-old female driver was placed under arrest. She was transported to the Wichita County Detention Center and was charged with Driving While Intoxicated and Criminal Mischief over $750.00 under $2,500.00. On Sunday June 18, at approximately 5:07 am, Corporal Cole McGarry and Deputy Caleb Myers made a traffic stop in the 1000 block of Holliday. The 54-year-old male driver was placed under arrest. He was transported to the Wichita County Detention Center and was charged with Driving While Intoxicated. On Monday June 19, at approximately 12:43 am, Deputy Amanda Price made a traffic stop at the intersection of Willow and Southeast Drive. The 17-year-old female driver was placed under arrest. She was transported to the Wichita County Detention Center and was charged with Possession of Marijuana under two ounces. On Wednesday June 14, at approximately 7:06 am, Deputy Jeff Lee responded to S.H. 240 near the 10th Calvary Creek in reference to Found Property. Upon arrival, a bicycle was found abandoned in the roadway. On Wednesday June 14, at approximately 8:41 am, Sergeant Sergio Teruel responded to the 2700 block of Harding in reference to a Fraud. Upon arrival, the Reporting Person reported that he paid a subject $100.00 to work on his vehicle and that the work was not completed. On Wednesday June 14, at approximately 4:40 pm, Deputy Kristian Valdez and Deputy Josh McGuinn responded to the 4500 block of Barnett Road in reference to a Theft. Upon arrival, the Reporting Person reported that his vehicle, a 1999 Ford Taurus, had broken down on U.S. 287 near Burnett Ranch Road. The Reporting Person reported that when he returned to pick up his vehicle, it was gone. On Wednesday June 14, at approximately 11:02 pm, Deputy Josh McGuinn attempted to stop a motorcycle in the 2200 block of Southwest Parkway. The driver lost control of the vehicle on Approach Drive and fled on foot. He was placed under arrest in the 6000 block of Kemp. He was transported to the Wichita County Detention Center and was charged with Evading Arrest or Detention with a motor vehicle. On Thursday June 15, at approximately 4:28 am, Corporal Cole McGarry, Deputy Josh McGuinn and Deputy Caleb Myers checked an occupied vehicle in the 1100 block of Central Frwy. East. The 28-year-old male driver was placed under arrest. He was transported to the Wichita County Detention Center and was charged with Possession of Marijuana under two ounces. On Thursday June 15, at approximately 2:26 am, Deputy Amanda Price made a traffic stop in the 2700 block of Southwest Pkwy. The 36-year-old male driver was placed under arrest. He was transported to the Wichita County Detention Center and was charged with Driving While Intoxicated. On Tuesday June 13, at approximately 4:59 pm, Deputy David Stout and Deputy Erick Jerrols responded to the 12000 block of McFall Road in reference to a Theft. Upon arrival, the Reporting Person reported that a subject entered the property and stole a mig welder. On Tuesday June 13, at approximately 1:50 pm, Lieutenant Patrick McFerrin, Deputy Scott Chapel and Deputy Greg Anderson responded to the 4600 block of Langford to serve a Mental Commitment Warrant. Upon arrival, the 37-year-old female was placed under arrest. She was transported to the North Texas State Hospital and was admitted. On Tuesday June 13, at approximately 9:45 pm, Deputy Kristian Valdez made a traffic stop at the intersection of Broad and 5th. The 37-year-old male driver was issued a citation for Possession of Drug Paraphernalia. On Wednesday June 14, at approximately 2:21 am, Deputy Josh McGuinn made a traffic stop in the 3200 block of Lawrence Road. The 31-year-old female driver was placed under arrest. She was transported to the Wichita County Detention Center and was charged with Driving While Intoxicated. On Monday June 12, at approximately 7:13 pm, Deputy Jeff Lee made a traffic stop in the 1700 block of 9th Street. The 28-year-old male driver and a 32-year-old male passenger were placed under arrest. They were transported to the Wichita County Detention Center. The driver was charged with three outstanding warrants for ran red light, driving while license invalid and speeding 83/60. The passenger was charged with four outstanding warrants for violate promise to appear and three counts of speeding. On Monday June 12, at approximately 5:39 pm, Deputy Jeff Lee made a traffic stop in the 900 block of Fillmore. The 44-year-old male driver was issued a citation for Possession of Drug Paraphernalia.